It’s time, my friends. The holidays are upon us and we can’t hold back any longer. Baking season, pumpkin season, and… stew season (with lots of seasoning…). Heat your favorite Dutch oven or stock pot over medium-high heat and add olive oil. Brown pork roast cubes on all sides, about a minute or two per side. Toss in the onions and apples about half way through. We want them to brown, too. But the time it takes to brown all sides of the pork is too long for the onions and apples, so that’s why the delay in adding them. Then add the stock, salt and pepper, butter, and herbs. Lower heat. 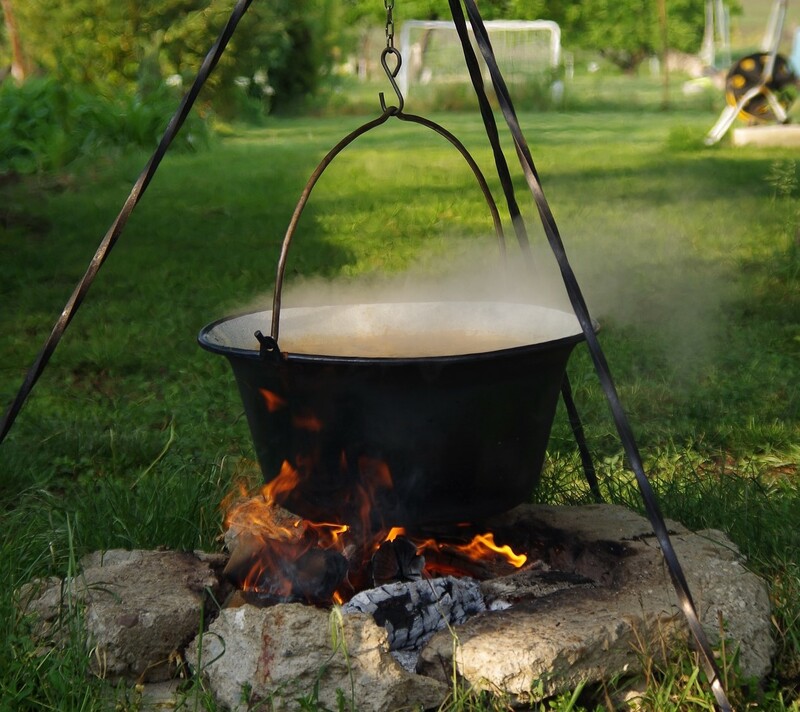 (If cooking over a fire, move it to the side so it’s not over direct heat but still hot enough to simmer.) Cover and simmer for 2 and a half hours. Remove lid and add mushrooms, garlic, carrots, and celery. (Add a couple of diced potatoes at this point if you’d like the resultant product to be a little thicker.) Recover with lid and simmer an additional 30 minutes. Remove from heat and serve hot. The herb sprigs are easy enough to fish out with tongs. Sprinkle each serving with chopped chives. That’s how we do it, folks. Happy Thanksgiving! Questions/comments/requests/suggestions/limericks/thoughts on life/childhood stories? Feel free to drop me a line at jasonr@pahaque.com. How to sanitize your fresh water tank on your travel trailer. Four of our favorite camping books.